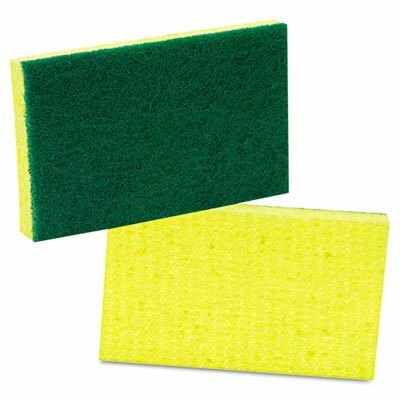 Scotch-Brite PROFESSIONAL Medium-Duty Scrubbing Sponge, 3 1/2 x 6 1/4, 10/Pack Help keep your home or business clean. The dual-action design of the sponge features a medium-abrasive Scotch-Brite scouring pad on one side and an absorbent yellow cellulose sponge on the other side. An ideal companion for the most common, medium-duty cleaning jobs. Sponge Type: Scrub Pad; Material(s): Cellulose; Scouring Pad; Shape: Rectangular; Width: 3 1/2". Scotch-Brite? scouring pad on one side, absorbent cellulose sponge on the other side.